This huge model of T-Rex himself is just over 40 cm long and has a built-in high quality image projector installed in his chest cavity. 24 different dinosaur pictures up to one metre wide can be projected onto bedroom walls. These include the scary Triceratops and Stegosaurus prehistoric creatures. The set also includes a special secret code word that gives children access to dinosaur facts and figures online. 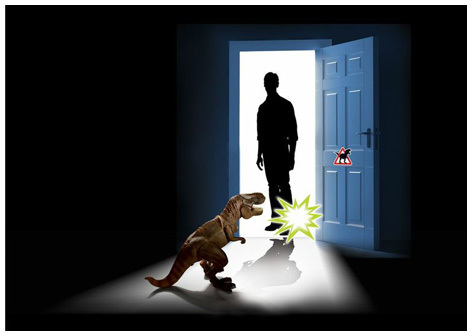 A T-Rex dinosaur sticker can be placed on a bedroom door to warn people to stay away! Sold in the UK by Brainstorm, the T-Rex Projector & Room Guard doubles up as an amazing room sentry. Kids just have to set the motion sensor and wait for unwanted visitors to trip the trembler switch. T-Rex then lets out an almighty ROOAAAAR! that scares off brothers, sister, mums, dads or other invaders! As an extra bonus, there are five different roaring sounds to choose from. 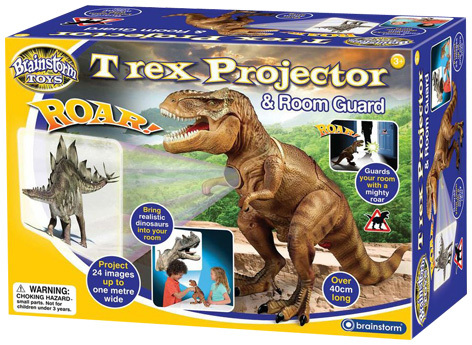 Please tell us what you think of the T-Rex Projector & Room Guard by Brainstorm.